Guess who rewatched the Rankin Bass Rudolph? It's my favourite ahh! I just love Christmas movies, I had to paint something. 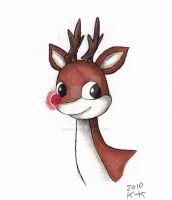 Cute fan art of Rudolph. I used to like watching this 1964 version of Rudolph the Red Nose Reindeer when I was little, but I now I grew out of it and now like the 1998 cartoon version of the movie. I love the 1964 version, stop motion animation is one of my loves though! They're both great, I love Christmas movies! It's my favourite Rankin Bass film; the animation is SO damn smooth, the music is memerable, and the characters are adorable!